You are currently browsing the tag archive for the ‘letter’ tag. Just sent Scott Walker this letter to the Governor’s Mansion in Madison. PS: Also, the beauty that is this. My Grandpa Hi-Guy was a pretty awesome man. I could tell you stories about him—or any of my family members, to be honest—for hours on end, but instead I’ve decided to keep this post short. All you need to know is this: Hi-Guy was a funny man. A constant jokester, prankster, and false grabber of crotches. Yes, you read that correctly. Hi-Guy passed away in 2008 at the age of 78. I was 31. In all those years, he sent me two pieces of mail (at least that I can remember), which was ironic because Hi-Guy worked for the post office. I received the first of these letters was when I was very young. It was a letter from “Mickey Mouse” sent from Disney World. 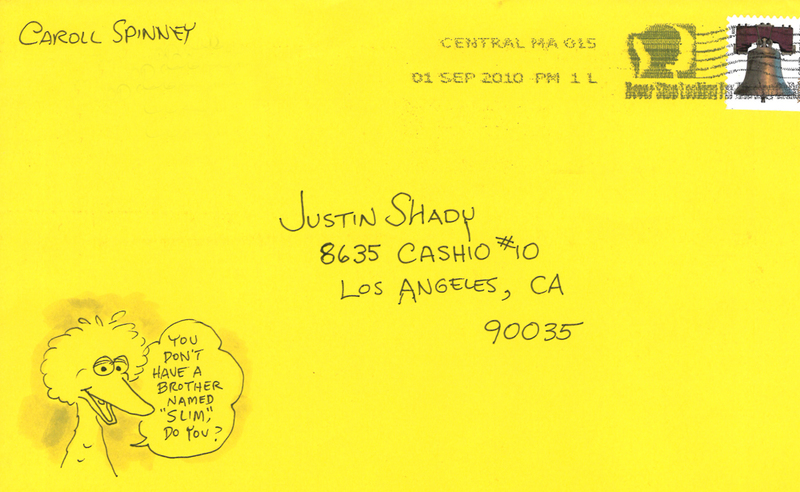 I was ecstatic that such an enormously popular cartoon character would take time out of his animated life to write me. Years would pass before I would put two and two together and realize that it was actually Hi-Guy who had written me under a rodent-based pseudonym. He wrote that letter (apparently) on May 21st of some year (he only marked the year “Zulu,” and I have no idea what that even means). He sent me that letter in a box when I was in college (so somewhere between 1994 and 1998). Also in that box was a “cheesehead” hat (quite literally, a styrofoam slice of “cheese”) that he had dug out of a dumpster. NOTE: Hi-Guy was a proud dumpster diver of junk. Or “treasures,” as he so often called them. The hat had a bite missing out of one of its corners. I always liked to think that a drunken college kid had taken bite out of it one night before tossing it into the dumpster. In reality, a rat had probably gnawed away at it before Hi-Guy picked it out of the trash. Before he sent it to me, Hi-Guy wrote “HUNGRY” next to an arrow that was pointing to the bite mark. It was pure Hi-Guy. You’ll notice the mention of “HUNGRY” in that letter. You’ll also probably notice that Hi-Guy had a habit of making up his own spellings of words. Over time, I’ve adopted this practice with words like “tanks” (for “thanks”) and “aite” (for “all right”) and “birfday” (for “birthday”). I take no credit for such goofiness. That was all Hi-Guy. Hi-Guy most certainly lives on in me. In my sense of humor. In my vocabulary and spellings. And in my memory. And I feel fortunate that I’ve managed to save one of the two letters he sent me. Also, I don’t think it’s any coincidence that he “signed” the above letter with a Mickey Mouse sticker. …and the words “(enough said)” were written on the front of an envelope I found on the ground last week. The envelope was sealed. When I opened it, I found this card inside. Written inside the card was this note. Placed loose inside the envelope was this silver heart. I’m assuming the intended recipient of the card will never see this, which kind of makes me sad. But rather than let it pass forgotten into the bottom of a dumpster somewhere, I figured I’d put it up here for posterity. …thanking him for having a part in getting me over my fear of flying. I sent the letter to the Sesame Street offices in New York. It got returned. 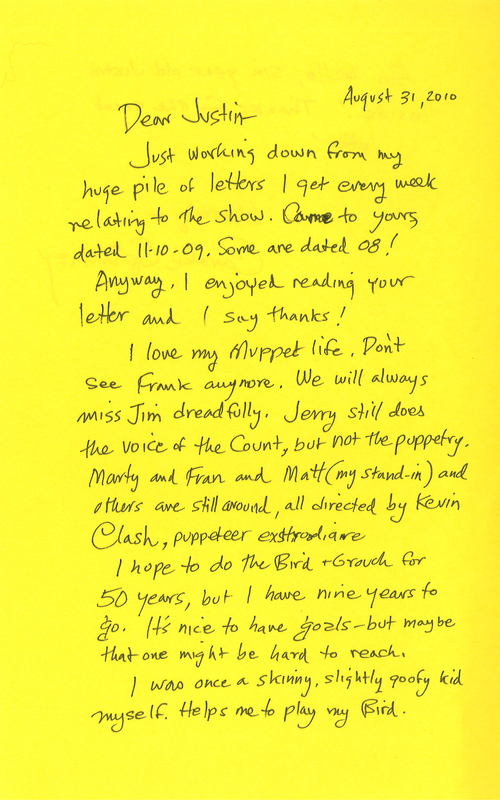 Then I sent it to the Jim Henson offices here in Los Angeles. It got returned. Finally, I sent it to a fan mail address in Connecticut. It got returned. After that last return, I gave up. I assumed there was no way to get him the letter, so I took a photo of it to, at the very least, keep it for my own posterity. About a month later, I was telling a friend about my failed attempts at getting the letter to Oz. This friend mentioned that he had a friend who was, oddly enough, going to Oz’s house the following weekend. He said that if I forwarded him the letter he would pass it on to his friend, who would then pass it along to Oz. My friend’s gesture was amazing (and I quickly took him up on the offer), but I’d be lying if I said that I expected the letter to actually get to Oz, especially after the debacle that had preceded it. Thanks to Michael and Andrea (and Amanda and Pete) for finally getting it to him! 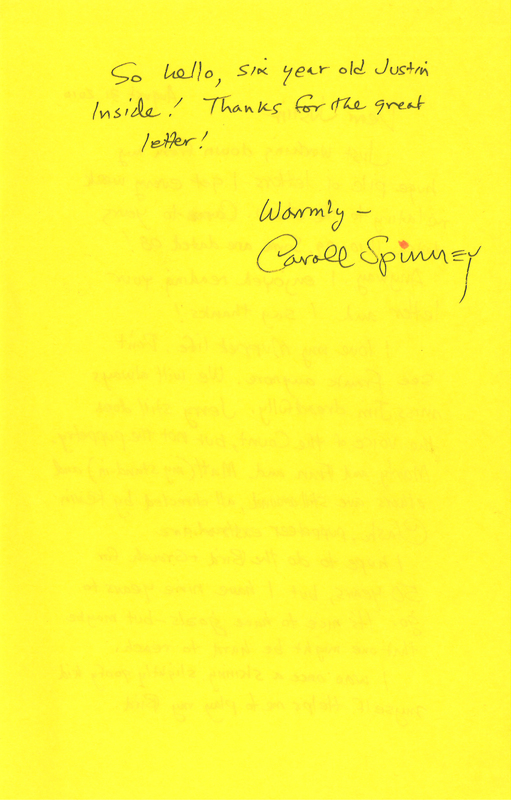 Last November, I wrote Caroll Spinney a quick letter to thank him for contributing to such a large part of my childhood. For those of you who don’t know, Spinney has portrayed numerous characters on “Sesame Street” for the show’s past 41 seasons. He’s best known for his work as both Big Bird and Oscar the Grouch. 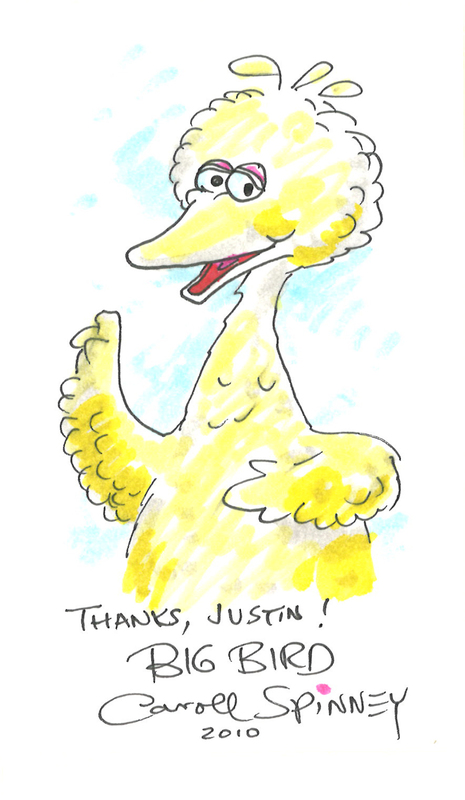 Spinney is also an accomplished artist; he illustrated numerous Sesame Street books throughout his career. So yeah… that was pretty awesome. Learn more about Caroll Spinney here.